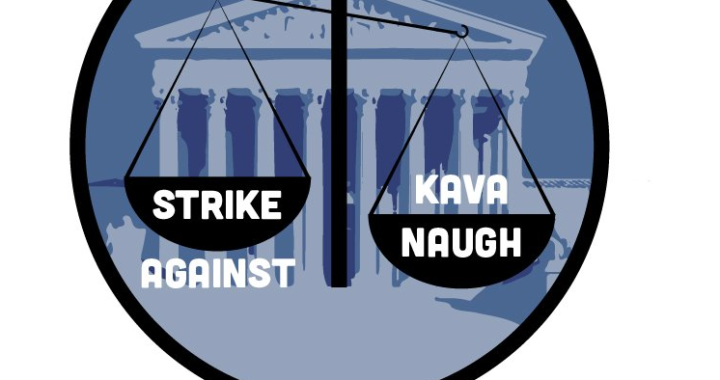 NLG students are organizing the #StrikeAgainstKavanaugh, 10/10-10/12 to impeach Kavanaugh. Join and endorse the strike! Today, law students released an open letter calling for a national student strike against the confirmation of Brett Kavanaugh. 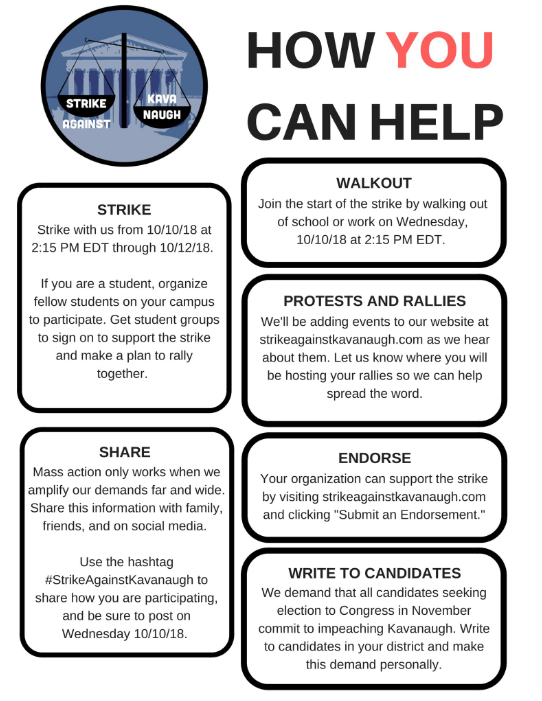 On Wednesday at 2:15 PM EDT, students will walk out and begin a three day strike protesting the confirmation and demanding that any candidate running for Congress commit to impeaching Kavanaugh. Students and non-students will participate in rallies and other actions throughout the three days. Law students have begun organizing events on a variety of campuses, including Brooklyn Law School, Cardozo Law School, Duke Law School, Lewis & Clark Law School, NYU Law, Rutgers Law School, University of Denver Sturm College of Law, UC Hastings College of Law, University of North Carolina School of Law, University of Southern California School of Law, the Chicago-Kent College of Law, and University of Miami School of Law. Students on other non-law campuses, including Georgia Tech and the Silberman School of Social Work, are also organizing. The National Lawyers Guild has officially endorsed the strike, and so have the following organizations: New Queens Democrats; New York City Young Democratic Socialists of America; NYU Law Women of Color Collective; National Lawyers Guild Brooklyn Law Chapter; Brooklyn Law School ACLU; George Washington University Law School National Lawyers Guild; Emory Young Democrats; Lewis & Clark Law School National Lawyers Guild; National Lawyers Guild Cardozo Law Chapter; and the Snohomish County Democratic Socialists of America. Mal Hyman, a South Carolina Congressional candidate, has also endorsed the strike. Information can be found at strikeagainstkavanaugh.com and on twitter at @KavanaughStrike. Organizations can add their endorsement at strikeagainstkavanaugh.com/#contact. Posted in Press Releases and tagged Brett Kavanaugh, Donald Trump, Law School, NLG Students, Protest, SCOTUS, Strike.